A past customer, Charlene, was so happy with her Heart Transplant Awareness Survivor Bracelet (B173-HRT) that when she saw our exclusive Life Life Give Life Organ Donation Awareness Bracelet (B113) she wanted to customize it -in red. 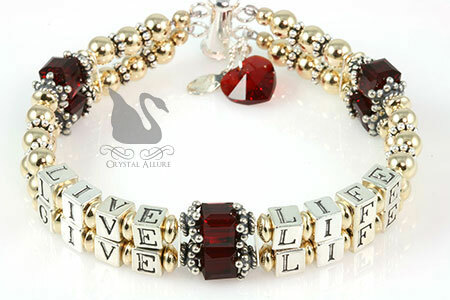 Working with Charlene, I re-created the two strands of sparkling sterling silver, mixed with 14 karat gold fill beads and .925 Bali accented by red Swarovski Crystals, bearing the message "Life Life Give Life" in sterling silver alphabet beads. To finish her custom design we added a red Swarovski Crystal heart charm and our signature jewelry tag. The idea to use red crystals, gold beads and a red heart charm were all Charlene's and it was my pleasure to be able to create her vision from our original design. I had some wonderful email exchanges with Charlene and I consider it a blessing to have "met" her and worked with her. The Live Life Give Life Crystal Transplant Awareness Bracelet is an Exclusive design to Crystal Allure Jewelry. Any bracelet not bearing our signature jewelry tag is a fake. All I can say is "WOW"!! Its absolutely stunning!! We were getting ready to go out the door to leave for Vanderbilt (5 hr trip) and the mail came. My husband went out to pick it up and the package was in it. I tore into it with the enthusiasm of a child at Christmas. I can't quit looking at it. Thanks so much for the matching bag and getting it to me prior to clinic. This was just a routine visit (if anything is ever routine with them, I think they think of ways to torture us, extra testing, lab sticks, etc). LOL. You would think I was used to it after 8 yrs, but it seems I start getting panic attacks just thinking of going. I looked at that beautiful bracelet and just chilled out. I even had a lady ask to look at it while I had my sleeve rolled up to wash my hands in ladies room. I explained to her what it represented, and she vowed to me to sign up to be an organ donor; is that not fabulous. With Charlene's custom LLGL bracelet request, she placed an order for one of our past designs from the Butterfly Fields butterfly jewelry collection. She said her grand-daughter fell in love with it and she wanted to give it to her for her birthday. I learned our youngest fan is 7 years old! Since creating the original design, I implemented new techniques learned and Charlene's custom design features a beautiful array of various sized fuchsia Swarovski Crystal butterflies that adorn an elegant 14 karat gold filled loop chain. Each crystal butterfly has been individually wire wrapped to a delicate chain for a truly feminine and charming design. Finished with our signature goldtone jewelry tag. Received the bracelet today, absolutely fabulous. My Katie is going to love it!!!! She has never forgot seeing it. She is going to be over the moon when she sees the matching earrings. Stephanie that was so sweet of you. They are absolutely beautiful. You will make a little girl very happy when she opens her birthday present next month (May). Again thanks so much for the beautiful creations. I absolutely love my bracelet. You may remember my good friend and fellow artisan, Barb, over at Bronson Hill Arts. She created the beautiful set of butterfly notecards for a giveaway this past December. Barb informed me, some time ago (yes, I'm still trying to catch up on things! lol), that she will be designating a portion of the proceeds from the sale of these notecards to the Lungs for Life Foundation. 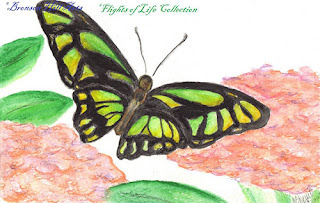 She has named this set of notecards the Flights of Life Collection and each notecard showcases the unique beauty of butterflies, which remain a symbol of newly transplanted lungs as they take their first breath of air. To order your set of butterfly notecards, simply visit the Bronson Hill Arts Blog and click on "ordering" at the top of the site. Not only are the butterfly notecards beautiful pieces of artwork, each set sold will help further the mission of the Lungs for Life Foundation. Thank you in advance for your support! And thank you to Barb for her support of the Lungs for Life Foundation. Back in February (wow! am I behind in sharing this!! 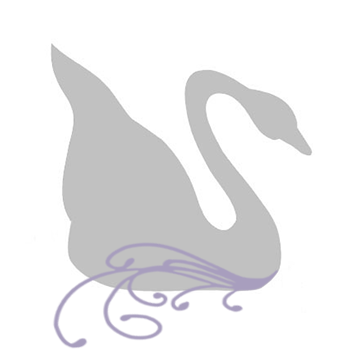 ), Elizabeth contacted me to design a custom mothers bracelet incorporating the hygroma awareness color. Burgundy is the support color of hygroma awareness. Elizabeth wanted to give this custom awareness-mothers bracelet as a gift to her friend who had lost her baby boy to hygroma. She requested the design also incorporate the baby's name. Working with the design elements of our original Swarovski Crystal Pearl Mommy Bracelet, I incorporated burgundy Swarovski Crystals and personalized the name to GRANT in memory of her friends' son. A final custom touch included a sterling silver cross charm. What really made Elizabeth's Custom Mothers Hygroma Awareness Bracelet (B188-HYG) a touching and beautiful gift were the sterling silver eternity knot rings that encircle the pearls. Grant's mother will love him for eternity and he will always be with her and in her heart. This special and unique beaded bracelet design not only raises hygroma awareness, it also celebrates motherhood and the loss of a child. It was my honor to have designed this very special treasured keepsake bracelet for Elizabeth and her friend. I hope in some small way this beautiful keepsake bracelet will help heal her heart and give her comfort.